House of Fraser has handed Capgemini UK a seven-year contact to take over the running of the retailer's entire IT operation. The contract, which begins this month, includes management of datacentre services, applications support and development, service desk and desktop support. These services were previously completed in-house and the agreement will see House of Fraser IT staff transfer to Capgemini UK. "About 70 House of Fraser IT staff are expected transfer to Capgemini and BT under TUPE provisions from March 2010," said Capgemini. House of Fraser said the deal provided access to a wide range of IT skills and capabilities, a more cost-effective IT support operation and considerable IT procurement and financing benefits. Capgemini's experience in the retail sector was cited as an attraction, as was its Rightshore delivery model, which combines onshore, nearshore and offshore delivery models. Leslie Willcocks, professor of technology work and globalisation at the London School of Economics, said this is the way all big service providers are moving. "The big Indian suppliers are moving in that direction also," he said. Willcocks said a large number of outsourcing contracts have been about cost savings, so it has been important for services to be provided from wherever offers the best price. He said the model often starts with 70% of services onshore, with the remainder offshore, and then reverses after two to three years. 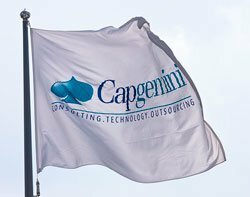 Capgemini will soon have more staff in India than in its home country of France. A new unit in Bangalore is expected to boost Capgemini's staff in India to more than 21,000, at least 1,000 more than its headcount in France. A recent study by Equaterra of 160 organisations, representing £10bn per annum of IT outsourcing contracts, rated Capgemini alongside Cognizant as the service providers with the highest level of customer satisfaction.